The Norfolk Tides today announced the return of a contest in which a local youth field will be renovated by Tides groundskeepers and front office staff. Proudly presented by Orkin, this field makeover will include an upgrade to the playing surface and an improvement to existing dugouts, with the recipient of the makeover being determined by a fan vote on the Tides' Facebook page. "We're thrilled to be able to add an additional field renovation to our schedule this year" said Tides General Manager Joe Gregory. "We've had such phenomenal success with this program in the spring that we decided to add another field makeover in the fall, and our entire organization is looking forward to helping out another worthy community." Those interested in having the Tides make over their facility should submit a picture of their field to Heather McKeating at HMckeating@norfolktides.com. Along with the photo, fans are asked to include a brief description of why their league's field should receive this enhancement. The deadline to submit this information is August 18, with online voting taking place on the Tides' Facebook page from August 21-25. 2017 is the sixth year the Tides have renovated a local youth field. 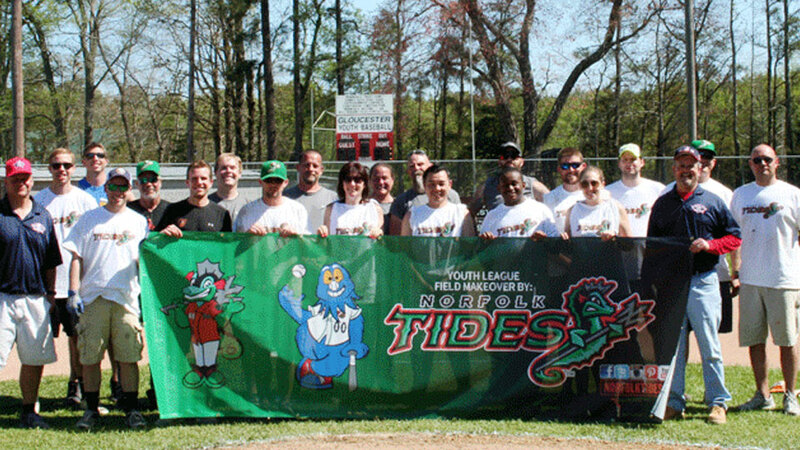 Since the program was introduced in 2012, the Tides have renovated nine local fields: Ocean View Little League (Norfolk), Smithfield Recreation Association (Smithfield), Bennett's Creek Little League (Suffolk), Phoebus Little League (Hampton), Shore Little League (Nassawadox), Cradock Little League (Portsmouth), Little Creek National (Norfolk), Gloucester Youth Baseball (Gloucester) and Surry County Pony Baseball (Surry). The project is made possible thanks to the Tides Youth Baseball Fund, a program established by the Tides in 1990 as a way to raise money for youth baseball and softball programs in Hampton Roads. In addition to assisting with field renovations, the Youth Baseball Fund also helps local teams and leagues with travel expenses. The Youth Baseball Fund is partially financed by scoreboard announcements at Harbor Park throughout the season, and those wishing to make a donation directly to the Youth Baseball Fund can do so via norfolkides.com under the "community" section.